EVANGELIST TERESA JONES. Motivational and keynote speaker, consultant, trainer, workshop leader, author, missionary and evangelist are just a few of the roles that can describe Teresa Jones. Evangelist Jones has an interesting and varied background. Her early secular career included serving as an Intensive Case Manager for the Mo. Department of Social Services where she assisted families in crisis situations with finding hope and direction. She was later employed for over 25 years with the Federal government, prior to her retirement. During her Federal career, she conducted fair employment training program compliance reviews and complaint investigations throughout the country including Hawaii and Porto Rico. She has served as a Regional Equal Employment Opportunity (EEO) Officer, Federal Women’s Program Manager, Contract Compliance Officer, Hispanic Employment Program Manager and a Lead EEO Training Instructor for the Army Corp of Engineers, Department of Labor and various other cabinet level Federal agencies. In addition, Ms. Jones is a U.S. Army Certified Training Course Manager in the Prevention of Sexual Harassment for Managers, Supervisors and Employees. She has provided fair employment training and technical assistance to many fortune 500 corporations and major universities including: General Motors, Kellogg, Cessna Aircraft, Kansas City Power and Light and the University of Missouri. In the religious sector, Evangelist Jones has served as a Christian broadcaster on several local radio stations for over a decade. 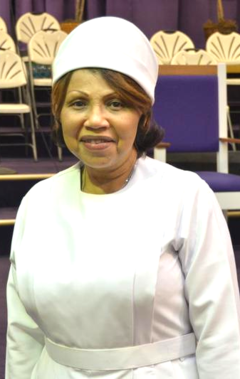 Ms. Jones is a fourth generation member of the Church of God in Christ. She is a licensed evangelist missionary and she served as the Jurisdictional President of the Young Women’s Christian Council for many years. Also, Evangelist Jones is the recipient of a United States Congressional Commendation for her volunteer work in the community and in ministry. Because of her expertise and work in the area of church prevention training, she has been a featured guest on the Trinity Broadcasting Network (TBN). Ms. Jones is the founder and President of The Source Connection, Inc. a Christian multi-cultural non-profit specialized training and development organization. Evangelist Jones holds a bachelor’s degree in Management from Ottawa University and she is a graduate of Avila University’s Women’s Executive Development Institute and the Federal government’s Management and Leadership Development Institute. Her favorite scripture is “And we know that all things work together for good to them that love God, to them who are the called according to his purpose.” Romans 8:28.